His extremely wide range of music includes tunes from classics to some of the best folk music around the world. This outstanding musician, as a part of an ensemble of folk instruments, took part on two countrywide competitions in Moscow and St. Petersburg, 1974 and 1975 respectfully. 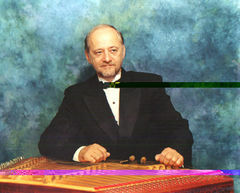 With the Ensemble of the Radio and Television of Belorusia, Vladimir recorded over 120 soloist compositions on his instrument, as well as made a numerous appearances on the National Television. One of the most interesting side of the concert life, Vladimir thinks, is traveling to other countries. He has toured over 20 countries on numerous occasions. Giving performances on stages of Germany, France, Italy, Spain, Madagascar, Mauritius, Mozambique and many more. After their performances, the newspapers of those countries have written how much the people have enjoyed their music and Vladimir’s skills as a musician. Since 1997, Vladimir Gorodkin and his family live in Toronto, Canada. In Canada, Vladimir continues to work as a musician. From the year 2000 until present he holds a license to perform at the Hudson’s Bay Company. At the same time, Vladimir also shares his passion for music with people at a variety of craft shows and festivals, like the “First Night Canada”(Sky Dome), “Russian Karavan”, “One of a Kind” craft show(Toronto), “International Tulip Festival”(Ottawa), and other shows around Canada.